Kofi Annan, Joint Special Envoy of the UN and the League of Arab States on Syria. Secretary-General Ban Ki-moon today announced the resignation of the United Nations-League of Arab States Joint Special Envoy for the Syrian crisis, Kofi Annan. Mr. Annan, a former UN Secretary-General, was appointed in late February to serve as the high-level representative of the Secretaries-General of the United Nations and the League of Arab States, providing good offices aimed at bringing an end to all violence and human rights violations, and promoting a peaceful solution to the Syrian crisis. Syria has been wracked by violence, with more than 10,000 people, mostly civilians, killed since the uprising against President Bashar al-Assad began some 17 months ago. Over recent days, there have been reports of an escalation in violence in many towns and villages, as well as the country’s two biggest cities, Damascus and Aleppo. As part of his efforts, Mr. Annan put forward a six-point peace plan to help end the Syrian crisis. The plan calls for an end to violence, access for humanitarian agencies to provide relief to those in need, the release of detainees, the start of inclusive political dialogue, and unrestricted access to the country for the international media. Despite initial signs of acceptance of the plan and repeated calls from UN officials, there has been little in the way of the plan’s implementation by the parties to the conflict. “The hand extended to turn away from violence in favour of dialogue and diplomacy – as spelled out in the six-point plan – has not been not taken, even though it still remains the best hope for the people of Syria,” Mr. Ban said. The UN chief noted that both the Syrian Government and the opposition forces continue to demonstrate their determination to rely on ever-increasing violence, and that, in addition, “persistent divisions” within the Security Council have themselves become an obstacle to diplomacy, making the work of any mediator vastly more difficult. “Kofi Annan deserves our profound admiration for the selfless way in which he has put his formidable skills and prestige to this most difficult and potentially thankless of assignments. 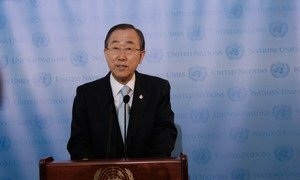 He has worked within the mandate provided to him by the General Assembly and with the cooperation of various Member States,” Mr. Ban said. “I remain convinced that yet more bloodshed is not the answer; each day of it will only make the solution more difficult while bringing deeper suffering to the country and greater peril to the region,” Mr. Ban said. Addressing reporters in Geneva today, Mr. Annan said the increasing militarization on the ground in Syria and the clear lack of unity in the Security Council had “fundamentally changed the circumstances for the effective exercise” of his role. “Yet the bloodshed continues, most of all because of the Syrian government’s intransigence and continuing refusal to implement the six-point plan, and also because of the escalating military campaign of the opposition – all of which is compounded by the disunity of the international community,” the Joint Special Envoy said. “At a time when we need – when the Syrian people desperately need action - there continues to be finger-pointing and name-calling in the Security Council,” he added. He noted that the June communiqué of the UN-backed Action Group on Syria – which called for the establishment of a transitional governing body, with full executive powers, as part of important agreed principles and guidelines for a Syrian-led political transition – provided an international agreement on a framework for a political transition. In a statement issued on Thursday afternoon, the President of the General Assembly, Nassir Abdulaziz Al-Nasser, expressed his regrets over Mr. Annan’s resignation, while at the same time commending his efforts and noting that he understands how difficult the Joint Special Envoy’s task has been. The spokesperson added that President Al-Nasser re-iterates his call on the international community to unite to put an end to the violence and find a peaceful solution to the Syrian crisis. The Security Council is due to hold consultations on Syria on Thursday afternoon, and the General Assembly is expected to hold a meeting on same issue on Friday. With as many as two million people affected by the ongoing conflict in Syria, Secretary-General Ban Ki-moon today renewed his call on all parties to put an end to armed violence and prevent further bloodshed.